Just a quick note to sayI'll be away for awhile. We are off on our annual trip to Montreal, then on to Saratoga Springs to take in the horse racing (thoroughbreds that is!) My father-in-law has been going to Saratoga for over 40 years, every weekend of their meet. Since marrying into this family I have joined in the trip - each of his children get one weekend to take him down to N.Y. and act as drivers/helpers. If I do get access I will visit blogs - but I will not be posting for at least a week. Take care all. I'll miss you! What do you wish to remember? Normally I answer the question first, then visit the other participants. Today I did the reverse and I was so moved by the other wishes. There is such strength in sharing and supporting the wishes of others. Poetry, photos and wonderful wishes - what a blessed mixture. I want to remember my life - my children, husband, parents and extended family. All the little memories that make up our lives form a tapestry we can look back at and rejoice in. I too fear alzheimers - the great robber of dignity and life. Along with remembering though, I want to celebrate all that I am and all that I was. I need to keep the connection with all those who have already left. Their memories are always with me. You too can support the wishes of others. "Answer the wish prompt above on your blog and then add a direct link to your post in the box below. Support wishes by visiting other participants, leaving a comment saying “As (insert name) wishes for her/himself, so I wish for her/him also.” It’s that simple. There is great power in wishing together." Once again it is ABC Wednesday. Another week to focus on a letter and find something to represent it. While driving last week it was barns that seemed to jump out to be photographed. There is something about their rustic, weathered nature that appeals to me. As I will be away for a week or so I thought I would get a jump on next week. So "C is for Cows - in this case the belties I discovered in North Carolina. These adorable animals have a white band around their middles - hence the nickname "beltie". I had to buy a little stuffed one for remembrance! Be sure to check out the other participants at ABC Wednesday! Last night was another night when sleep wouldn't come easily. So I got up and ended up creating - much better than eating!! I decided to create postcard size affirmation cards to go with the journal pages. I even added a second "D" card as I needed a reminder that I need to dance! The lovely Angie, from Angie's Art Time, has bestowed on me the Watermelon 10 Award. I had seen it on numerous blogs but had not really known too much about it. Angie, a fellow teacher, really made my day with her wonderfully kind words about me and my blog. Thanks Angie! I believe that it is for people who share their creative spirit through their blog. So ladies, grab the watermelon and post on your blogs - you all deserve it!! This week my focal word is "DREAM". I have just begun an online course on Vision Journaling ( Creating the Life of Your Dreams) with Kathryn Antyr of True North Arts. Each week, for 6 weeks, we will be completing challenges and activities to uncover our goals and apirations. Our first project was to create a collage of what brings us relaxation and serenity. The images I used reflect my belief that there is growth, beauty, power and change involved in our dreams. Thus the images help to show that. George Bernard Shaw: “You see things; and you say, "Why?" But I dream things that never were; and I say, "Why not?" William Arthur Ward: "If you can imagine it you can create it. If you can dream it, you can become it." Sue Ebaugh: "Within our dreams and aspirations we find our opportunities." Stephen Leacock: 'May be that those who do most, dream most." Then I went on to create my serenity collage. The images here all bring me peace/relaxation/serenity. Water has always been a source of peace for me, thus most of the images show water. But dance, music, massage, sky, flowers are some of the ways that I use to relax. Besides the collage I will also be creating affirmation cards to lead me through this visualizing course. I am looking forward to uncovering more of my intentions and deep dreams. Inward reflection will be a part of this journey (as well as with "The Artist's Way" - which I am reading with another group). Wrecking my journal this week was sort of an after thought. I realized yesterday I had not done much so did some of the paint pages. Trouble is when I went to photograph the pages, I did more wrecking just trying to pull the pages apart! I am finding this journey a fun one and watching the creativity of others has been the best part of it all. I am becoming fired up to do so many other things. So thank you ladies for your awesome creativity! Not a lot but fun anyway. Hard to believe there is only one more week. Lots to do - but I know that the momentum is there - I want to finish the journal. I don't want there to be blank pages. Be sure to check out the other "Wreck This Journal" participants. Late last night when I could not sleep, I pulled out my journal and wrote 3 words - ACT, BELIEVE, CREATE. I had been thinking about a post I read yesterday on Affirmart by Sema about her Power Words. The whole idea of using words to guide you has resonated with me for some time. I started this year with "BELIEVE" as my one word intention for 2009. Sema has been working through the alphabet and choosing a word for the week as an affirmation. I have been doing the ABC Wednesday challenge and really enjoying it. There the focus is more on photos and then describing what you have chosen. I realized last night that we are about half way through the year, with just less than 26 weeks til 2010. As I am working through "The Artist's Way" through the On the Wing ning group, I am realizing that belief in one's self and one's art is paramount. That it is the process of creating, of showing up on the page that matters - not the end result. Then this morning Violette, who created the Bliss Journal, sent a set of Creative Play cards to download and use. Talk about synchronicity. These small, colourful action words act like affirmations as well. So I am starting my own challenge to create my own 26 affirmation cards, that will help me focus each week on an action I need to take. I will post Sundays, from now on, as I journey through the 12 weeks of "The Artist's Way" and other positive books. This is Wishcast Wednesday and I realize that by creating my affirmations I am also making a statement. I wish that my ABC's of Act-Believe-Create will carry me through , not only the rest of 2009 but throughout my life, and as I internalize them my creativity will grow. We are now beginning Round 5 (year 3!) of ABC Wednesday. It is a fun project and you are asked to share photography or art relating to the leter of the week. Then post your entry and visit other participants. My choice to start this round is "arrow" - to point us in the right direction! Can you image the pileups if there were no arrows?? Although too many people just ignore them anyway. Visiting friends for a reunion last weekend, I met the son of our friend and we got talking about arrows and what the project ABC Wed. was. Lo and behold, he had an actual arrow and bow. When I went to take a picture of them, my friend remarked, "That's Adam the archer!" The ultimate A - Adam the archer holding an arrow. "What are your favourite ways to celebrate yourself?" As I thought about it and started listing the ways that I nourish myself, I realized that many of the ways involve my husband. We have been together for 9 years - 7 married. This is both our second marriage and we treasure it. We have had many ups and downs in our marriage (our first year of marriage we lived apart as we were waiting for his kidney transplant and as the donor I had to stay with the board where I was teaching.) We survived almost 2 years on dialysis, the transplant, moving, unemplyment, new home, step-families, and more. But through it all, he has always been supportive of what I do. There is usually fresh cut roses on our table and cards for monthly anniversaries. There are shows and trips we both enjoy. There is much affection. I have been fortunate in my second marriage. Of course, there are still some waves but at least we are together in meeting them. The loss of my Mom last May was a huge blow. There were trials with my family before she died and they have not all been resolved. It has taken me a year to really accept her death and feel like I am coming out of a deep, deep well. My husband has helped me, as have my family and friends. In February I entered blogland, and that has healed me greatly, by giving me a voice, an outlet for creativity and challenges to meet. So thank you to all whom I've met and visited and who have visited here. That has meant a lot to me - you really don't know how much! So, besides love, affection, family, friends, flowers, our cat, music - being creative has really nourished me. This past weekend I finished the angel cards for my first giveaway winners and they will be heading out tomorrow. Thanks again to the winners for their help! I also finished and mailed the zentangle ATCs for the swap at ATCs for All. This was the second swap I have done but the first with this group. I loved the zentangles. Next I want to try the mandala zentangles! I also created a couple of tags that celebrate love. May we all have it in our lives. Here is one of the angel cards that will be winging their way to the winners! Before I announce the winners though, I just want to say a huge THANK YOU to everyone who entered and offered such great ideas. I am still trying to decide! I put all 6 names on paper, laid them out and was ready to put them in a container for my husband to draw, when I realized I couldn't just pick 4 names! So ladies - all of you are winners! Please send me your addresses (via email) and I will get your prizes to you ASAP. Well we are counting down to the end of our wrecking days! Only 2 more weeks after this. As I went through the journal this past week I was amazed at just what I had left to do: most of the writing! I love to write and yet I could not get down to long pages of writing about a boring time or activity!I took it with me to a reunion of former teachers and they had fun adding to some of the pages. *decorated my journal's cover (I've added my name over this and did stamping on the front). *and added to a number of pages, as well as adding pictures throughout the journal. But although I didn't do as many pages or do as much destruction as I had planned, I was creative in other ways. I have also joined in several ATC swaps and am enjoying that as well. I'm creating Zentangles right now! It is so00 addictive. Have a great week wrecking! Be sure to check out the other wreckers at Wreck This Journal. Judith of Judith B. Designs has a fabulous giveaway of a copper pendant she entitles "Luna".
" 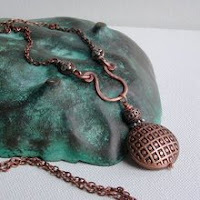 I created this piece I call "Luna"...the chunky copper pendant reminds me of a full moon. This necklace is 32"long with a 2 1/4" drop. Components are copper and sterling. This necklace can be shortened to the length the winner desires." You have until 11:59 p.m.on Sunday July 19th for your chance to win this pendant. Hurry over! At Megan's blog there is a chance to win 1 of 3 of Chelsea Rose's lovely prints.
" (Her) artwork is reminiscent of Tim Burton's movies and personal drawings. She works in pen and ink for her small drawing and acrylic paint for her larger paintings. Each piece contains her signature reptilian eyes, curlicues, and lovely dresses. The winners of the giveaway will get a 5" x 7" print of her work printed on cardstock and sealed in clear, archival sleeves." Hurry over now - not much time left! What do you wish to invite in? This is the first Wishcast from Jamie's new website. You really need to explore and see what wonderful things she has to offer. As well, see how easy it is to be a part of this wonderful group of Wishcasters - there is much power in numbers. What do I wish to invite in? My greatest wish right now is for good health for my husband and myself. We are both experiencing some health issues which we are monitoring. Secondly, I wish for peace, serenity, happiness - for the both of us and our extended families. And last, but not least, I also wish for a renewal of friendships that have drifted away and for family ties that have unraveled. Okay - I know shopping does not start with Z! But I found 3 stores that start with Z and I couldn't resist the play on words (based on a children's book - "Q is for Duck"). In Ontario both Zellers and Zehrs are quite popular Canadian stores. Zellers is now part of the Hudson's Bay chain. It competes with Walmart (from the States). On the Bay's website, Zellers is described as: "... the mass merchandise retailer of the Hudson’s Bay Company and is a leading Canadian mass merchandise department store chain with 279 locations in communities nationwide." I carry my Club Z card and collect points. I prefer Zellers to Walmart - less crowded and frantic. Zehr's is one of the major grocery stores in Ontario which I shop at fairly frequently. "When Emory Zehr and sons Lester and Clifford opened the first Zehrs store in Kitchener, Ontario, in July 1950, they had one overriding philosophy - put yourself in the shoes of every customer who comes through the door. That emphasis on customer service, along with a policy of offering "good value at a low price," proved a winning formula. More than 50 stores and over half a century of service later, Zehrs is today one of Southern Ontario's most successful retail grocery chains." Here is a photo from their website of the first market. "Zara is renowned for transferring the latest looks into affordable fashions less than a month after they appear on the runway. " I just happened to see it as we were driving down Bloor to visit my sons. I had just a second to take the photo. So, have never been in - can't give a recommendation one way or the other! Creative Every Day -focus on "SELF"
This month at Creative Every Day the focus is on SELF. This month for me is also a focus on self. I have been trying very hard to be creative every day - whether it is photographing (which I am loving more and more), working on "Wreck This Journal", collaging, or working through some art books. Last week I started a new project - my own set of 52 cards, with each number/face card having a different theme. I set up a giveaway (see the previous post) and have received some great ideas for certain numbers that were challenging me. (By the way, the giveaway is up on Friday.) This is a challenge for me (both the project and the giveaway -my first) but I am enjoying it. Then today when I was thinking I needed a way to focus on getting at some issues - my very own copy of Violette's "Journal Bliss" arrived. (I had won it on her giveaway!) Talk about syncronicity! 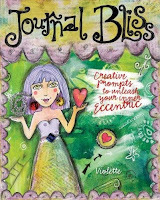 The Journal Bliss is gorgeous and filled with ways to follow your bliss. I am so going to love diving into this book! Thanks Violette! So this week will be a busy crafting week - journalling, collaging on the cards, wrecking the journal and photographing. I will also be continuing the purge!. I am collector -especially of paper and books! I am trying to do a bit each day and by month's end I hope to have my studio! (Saying it hopefully will be my prod to keep working to that end. I visited Mel"s From Clutter to Shine blog today and ended up doing the personality test she wrote about. She is always a joy to read and visit. "They will find great satisfaction if they encourage and develop their artistic abilities. That doesn't mean that an INFP has to be a famous writer or painter in order to be content. Simply the act of "creating" will be a fullfilling source of renewal and refreshment to the INFP. An INFP should allow ... herself some artistic outlet, because it will add enrichment and positive energy to their life." Wow! No wonder I was sad at times - I needed to create! So create I will most definitely - and not worry about the result so much as the process! RENEWAL , ENRICHMENT, POSITIVE ENERGY, REFRESHMENT ! What a lot I can expect to receive from creating daily! ABC Wednesday - Y is for Yolk, Yellow Yolk!